Kalaripayattu-the oldest of martial arts-is a gift to the modern world and known as the mother of all martial arts. legend traces the 3000-year old art form to sage Parasurama-the master of all martial art forms and credited to be the re-claimer of Kerala from the arabian sea. Kalaripayattu originated in ancient south India. Kung-fu, popularized by the monks of the shaoline temple traces its ancestry to Bodhi Dharma-an Indian Buddhist monk and Kalaripayattu master. Legend: Shiva the Great Yogi who dwell on Mount Kailasa in the high Himalayas, deep in the dhyana meditation,was said to have taught Parasurama the art of Kalaripayattu. Parasurama taught his 21 desciples (all Brahmins themselves) the art of Kalari payat.it was created by the warrior saint parasurama,an incarnation of lord Vishnu,by throwing his axe into sea which receded till the point where it fell.Parasurama then established forty two kalari and taught twenty one masters of these kalaris to protect the land he created. Training: the holistic approach is aimed at the ultimate co-ordination and control over mind and body.the weapons become an extension of the boady,controlled by the mind to achive high degree of protection in both offensive and defensive combats.the inherent beauty of this art from lies in the harmonious synergy of art,science and medicine. The grand training schedule demanding dedication,decipline and devotion is stratified into different levels. Basic Level includes unarmed techniques through which the aspirant achieves mastery over his body movements and balance .Intermediate level,the student is trained to attain the agility ,flexibility ,and co-ordination of body movements .Advanced level involves training with weapons ,Instructor Level involves proficiency in the usage of sword and shield ,spear and lastly urumi or the spring sword. Traditionally the kalari is constructed by digging a hollow in the ground forming a sunken area four feet in depth, forty two feet in length and twenty one feet in breadth .this is usually called Kuzhikalari.Kuzhi means”portions formed by caving in the earth” in the Malayalam Language . 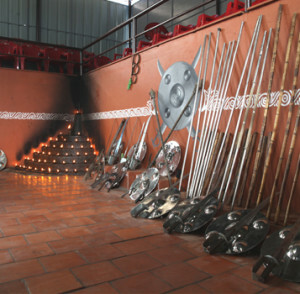 At Kadathanadan Kalari Centre ,Thekkady,this martial art is performed in kuzhikalari.Ahighly designed gallery has been built in such a way that the viewers will get a clear vision from a safer distance. Kalaripayattu is a traditional psycho-physiological discipline emanating from Kerala’s uniqe mytho-historical heritage as well as a scientific system of physical culture training. Copyright 2018 @ Periyar Tourism.